Back to the roots: Pregnant Meg (Haruka Tobaru) visits her birthplace Zamami in Okinawa Prefecture with her European friend and photographer Christopher (Daniel Lopez). Christopher wants to focus on the famous Kerama Blue underwater landscapes in his shots, but feels totally misunderstood as a human being and the relationship is put to the test. Whether the South Sea flair and the friendly islanders can still change his mind? 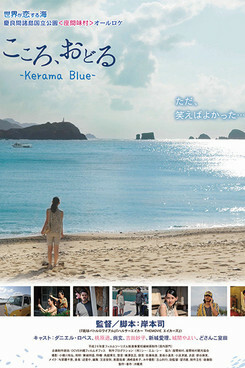 Kerama Blue - idyllic Japanese island, constant trouble with technology and Lost in Translation. No matter, we islanders don't let anything spoil our mood! - absolutely adorable, especially the grandmother! Kerama Blue wurde auf dem 19. JFFH 2018 gezeigt.